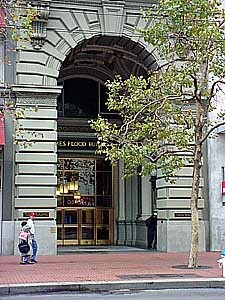 In the early 1920s, when Hammett was still sleuthing, the San Francisco branch of the Pinkerton National Detective Agency, (the real-life counterpart of the Continental) was located at 870 Market Street, at Powell: the James Flood Building. 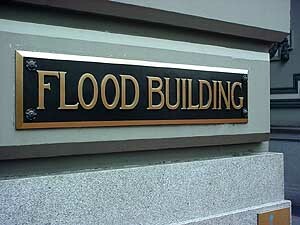 Located on Market next to the cable car turntable, the Flood Building has appeared on picture postcards for over a century. 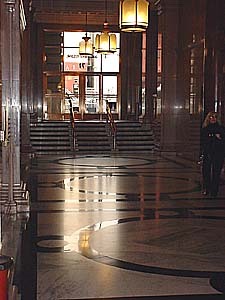 A massive twelve-story structure, its ornate marble hallways contain hundreds of offices, including room 314, the former Pinkerton office. 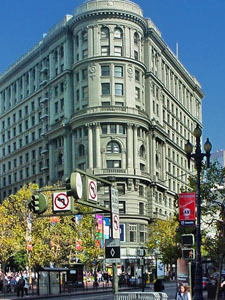 “The Continental Detective Agency’s San Francisco office is located in a Market Street office building,” the Continental Op tells us in “The Big Knockover.” The route that the Op takes after leaving his office makes it pretty clear that he was talking about the Flood Building, where, not coincidentally, Hammett was once employed by the Pinkerton National Detective Agency. 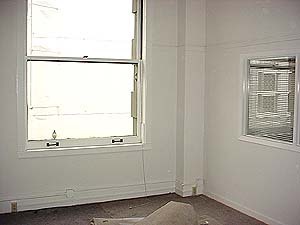 In the autumn of 2003, I visited room 314, accompanied by fellow Hammett enthusiast Vince Emery. 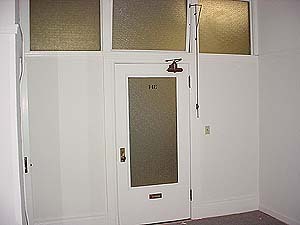 The office was unoccupied at that time, and in the process of renovation, awaiting a new tenant. 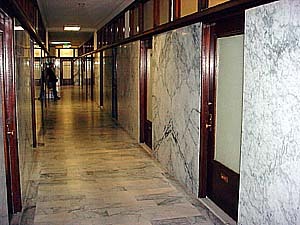 If you saw the 1978 remake of Invasion of the Body Snatchers, starring Donald Sutherland, these hallways probably look very familiar. 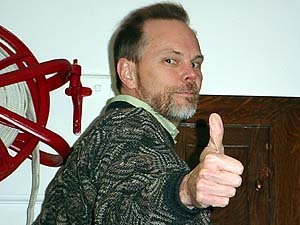 Vince Emery, the publisher responsible for much of the renewed interest in Hammett. 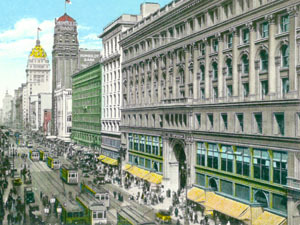 In the 1920s, the view from the window would have been of the old Emporium. 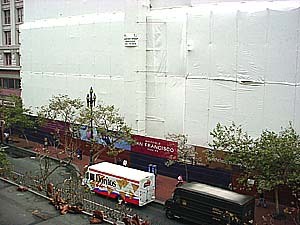 In 2003, the facade of the old Emporium was hidden behind a huge sheet of white vinyl, while it was being transformed into the Bloomingdales-anchored San Francisco Centre. Looking from the window of 314, all you could see was... white. It remained that way until 2006. 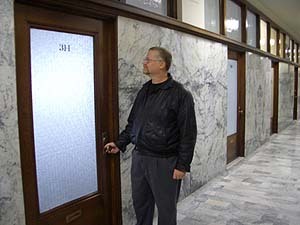 Vince and I decided (based on nothing at all, of course) that the adjoining room immediately to the left was where the operatives waited for assignments and interviewed clients. 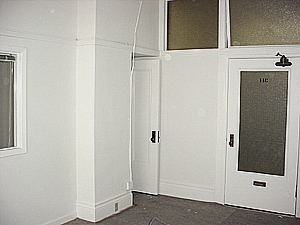 The room on the right belonged to the supervisor, called the Old Man in the stories. In real life, the boss was Phil Geauque (pronounced Jee-ack). The Op tells us that the Old Man, after a half-century of detective work had been left with no feelings on any subject. He was equally dispassionate about a weather report or a multiple homicide. It’s difficult to say at this late date if this reflected Geauque’s true personality. 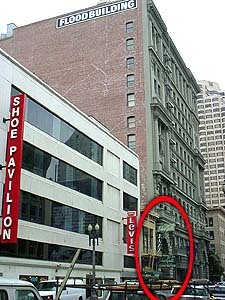 It’s also interesting to note that John’s Grill, mentioned prominently in The Maltese Falcon, is directly next door the Ellis Street entrance to the Flood building. 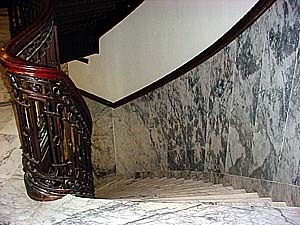 No doubt, Hammett used to duck out the back door to grab a bite at John’s. 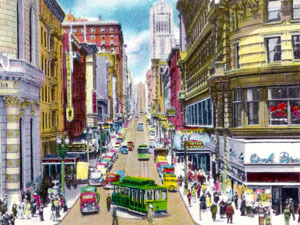 John’s Grill, the real-life restaurant where the fictional Sam Spade grabbed a bite to eat, is situated right next to the Flood Building, on the Ellis Street side.